By Emma de Villiers International Day of the Girl Child is 11 October. This year’s Day focuses on innovating for girls’ education. Smart and creative use of technology, policies, partnerships and, most of all, the engagement of young people, themselves, are important for overcoming barriers to girls’ learning and achievement. Nokulunga Dladla, 19, is studying for a career as a dentist, thanks to a programme in South Africa that aims to mentor girls in mathematics, science and technology. 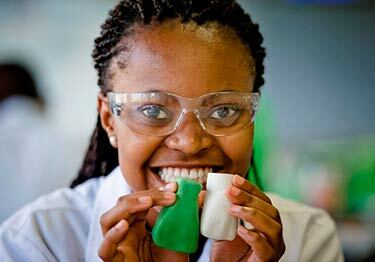 PRETORIA, South Africa, 10 October 2013 – The young woman’s smile lights up as she puts on the white lab coat she has grown used to wearing every day. As Nokulunga ‘Nonku’ Dladla leaves her apartment dressed for class, the 19-year-old student knows that every day brings her one step closer to fulfilling her dream of becoming a dentist – one step closer to being called ‘Doctor Dladla’. As a child, Nokulunga could hardly have imagined that she would one day be attending university, let alone studying for a medical degree. Enrolled as a second-year dentistry student at the University of Pretoria, Nokulunga is worlds away from the violent township she grew up in. Raised to believe that girls had no place in careers dominated by males, she had little aspiration to study beyond secondary school. Her parents separated when she was 10, and her mother had to rely on odd jobs to put food on the table. 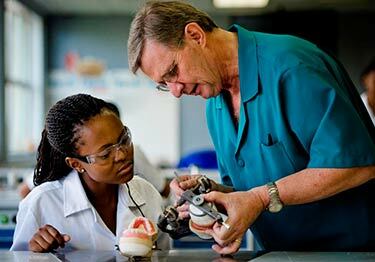 A dental technician teaches Nokulunga ‘Nonku’ Dladla, a second-year dentistry student at the University of Pretoria. Nonku grew interested in dentistry after participating in the UNICEF-supported Techno Girls programme. Techno Girl aims to expose girls to careers in fields such as engineering, science and medicine. The programme is a collaboration among the South African Department for Women, Children and People with Disabilities; civil society groups; private sector partners, and UNICEF. For Nokulunga, an internship at an engineering company as part of Techno Girl was a turning point. Before the internship, mathematics and science were merely subjects she had to pass. But with every day of the internship, her eyes opened more and more to the possibilities these subjects presented for her future. Many girls in South Africa are never given the privilege of forging their own career path. And although more girls than boys enroll for mathematics and physical science, boys still outperform girls in these fields, according to national statistics. As a result, many girls leave school without the necessary competencies to pursue careers involving math, science and technology. The Techno Girl programme, however, is slowly turning the situation around. More than 10,000 girls have been enrolled in mentorship opportunities as part of the programme. Not only does it expose them to real-life work experience, it also broadens their outlook on technical subjects outside the classroom. Nonku displays the first front tooth she successfully moulded in her dentistry programme. “It showed me that as a girl I can pursue any career that I want,” she says of the internship she held through Techno Girls. The programme recently launched the Techno Girl Alumni Association, giving girls who have been through the programme the opportunity to mentor younger girls with dreams of becoming doctors, scientists or engineers. Nokulunga is a proud member of the Alumni Association, and she hopes that her story will inspire other girls from underprivileged communities to study medicine.